An Azure container registry stores and manages private Docker container images, similar to the way Docker Hub stores public Docker images. It can also host repositories for Helm charts (preview), a packaging format to deploy applications to Kubernetes. You can use webhooks to trigger events when certain actions take place in one of your registry repositories. Webhooks can respond to events at the registry level, or they can be scoped down to a specific repository tag. For details on webhook requests, see Azure Container Registry webhook schema reference. Azure container registry - Create a container registry in your Azure subscription. For example, use the Azure portal or the Azure CLI. The Azure Container Registry SKUs have different webhooks quotas. Docker CLI - To set up your local computer as a Docker host and access the Docker CLI commands, install Docker Engine. Navigate to the container registry in which you want to create a webhook. Select Add in the webhook toolbar. Name The name you want to give to the webhook. It may contain only letters and numbers, and must be 5-50 characters in length. Service URI The URI where the webhook should send POST notifications. Custom headers Headers you want to pass along with the POST request. They should be in "key: value" format. Trigger actions Actions that trigger the webhook. Actions include image push, image delete, Helm chart push, Helm chart delete, and image quarantine. You can choose one or more actions to trigger the webhook. Status The status for the webhook after it's created. It's enabled by default. Scope The scope at which the webhook works. If not specified, the scope is for all events in the registry. It can be specified for a repository or a tag by using the format "repository:tag", or "repository:*" for all tags under a repository. Prior to using the webhook, you can test it with the Ping button. Ping sends a generic POST request to the specified endpoint and logs the response. Using the ping feature can help you verify you've correctly configured the webhook. Select the webhook you want to test. In the top toolbar, select Ping. Check the endpoint's response in the HTTP STATUS column. To test an ACR webhook with the Azure CLI, use the az acr webhook ping command. To see the results, use the az acr webhook list-events command. 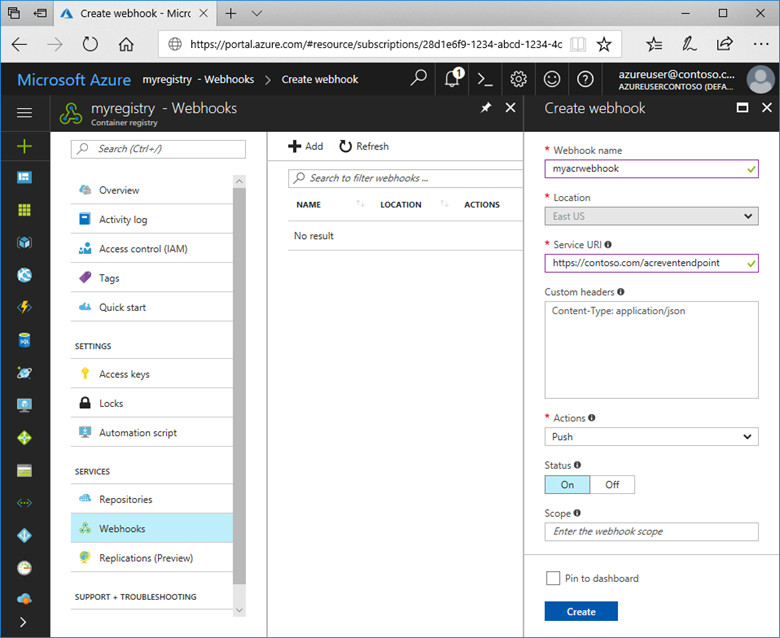 Each webhook can be deleted by selecting the webhook and then the Delete button in the Azure portal.